The Chesapeake and Ohio Historical Society is proud to offer The C&O Railway Heritage Center | Clifton Forge. This Center is a railway heritage museum, interpretive, educational, and visitor’s center that tells the story of the C&O Railway: the people, the places, and the technology. The story is the essential American tale of how our nation grew, how we lived and worked, and how we were all connected together by twin rails of steel. The purpose of this center is also to honor the memory and contribution of all the railroaders who built the railroads that allowed our nation to prosper, and all those railroaders who continue to keep America moving by rail. The Goal of the Center is to be an inspiring, stimulating place that delights all who visit and leaves them with an understanding of the heritage of American Railroading. It is also designed to attract visitors and stimulate the economy of our community. Finally, it is to be a “center” of the Alleghany Highlands community, of the C&O Historical Society, and of all the railroad centers within Virginia’s Rail Heritage Region. Clifton Forge, though a small town, was an important place on the C&O. 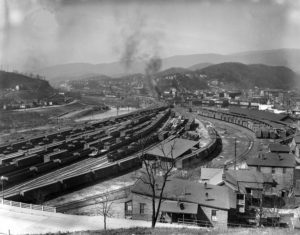 It was where locomotives were serviced and readied for the trip West over the Alleghany Mountains and East over the Blue Ridge Mountains and down the James River. There was a large shop facility for the overhaul and repair of locomotives. There was a large rail yard for classifying coal and other freight, a yard for less than car load freight, an icing facility, the main laundry facility for the railroad, a passenger coach yard, and the division headquarters for the region. It was all the things that comprised a railroad, crowded into a small crescent of land next to the Jackson River, and an archetypal example of the American Railroad. The Center is also dedicated to preserving and telling the story of Clifton Forge.